Interestingly, the StuG III was the most widely produced armored fighting vehicle in Germany during WWII, with more than 10,500 manufactured by war’s end. Initially introduced as an infantry support weapon, it developed into an effective tank destroyer. StuG vehicles were faster and cheaper to build than regular turreted tanks. 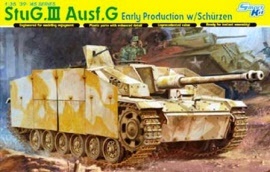 The final and definitive version of the famous StuG III was the Ausf.G., of which 7,720 were produced. 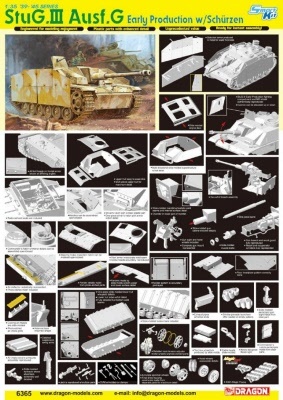 Dragon has previously released a number of 1/35 scale kits of StuG III variants, and now the latest kit has just been launched. Item No. 6365 depicts an Early Production version of the Ausf.G with the “boxy” gun mantlet that mounted a 75mm StuK40 L/48 main gun. Dragon’s new 1/35 scale kit is a Smart Kit, so it is provided with many handy touches like photo-etched parts and slide-molded plastic components. It includes a full gun mount and breech inside the fighting compartment, with even the floor treadplate pattern accurately rendered. For modeling convenience, 40cm Magic Tracks are offered. Photo-etched parts like mesh for the air intakes add extra realism. One highlight of this new release is upgraded Schu"rzen made from metal. This metal medium allows the 5mm thickness of the original side-skirts to be accurately depicted. This kit is a welcome addition to Dragon’s StuG III family, and it gives modelers all they need to represent an early version of the ubiquitous and deadly Ausf.G. The best eCommerce software by ShopFactory powers P1997. All-in one eCommerce and shopping cart software.